Free Printable Thomas Tank Engine Behavior Chart. 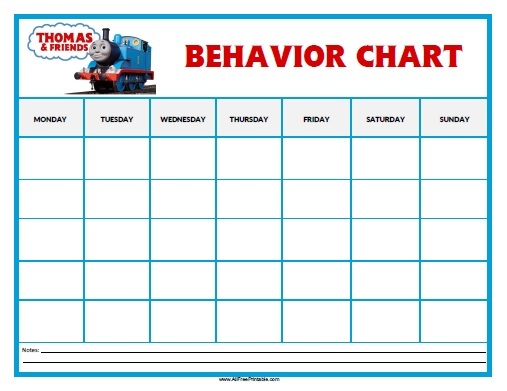 Free Printable Thomas Tank Engine Behavior Chart, a great idea for parents looking for ideas to improve children bad behavior. If your kids like Thomas the Tank Engine and Friends, they are going to love this chart. Print this beautiful Thomas Tank Engine Behavior Chart free using your laser or inkjet printer. You can use Thomas and Friends stickers for a fun way to improve your kids behavior throughout the chart. Save money by printing all the Thomas Tank Engine Behavior Chart you need for free. Includes 1 Behavior Chart per page with Thomas the Tank Engine in PDF format. Click the link to download and print the Thomas Tank Engine Behavior Chart template free in PDF format.